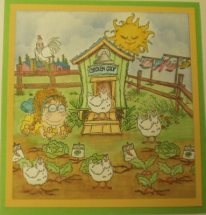 I have another wonderful week of email entries and great inspiration from our Design Team for the "Down on the Farm" challenge here. And here is the amazing inspiration from the Design Team. Now it is your turn to show us what farms in your area look like. Please make sure your creations are finished projects like cards and tags. You may enter up to 3 times and as many challenges as you wish. 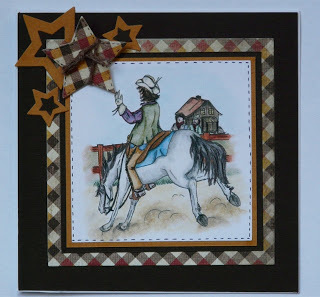 If you do not have a blog or account on Split Coast Stampers, then just email me a picture of the piece and I will add it to one of our posts. 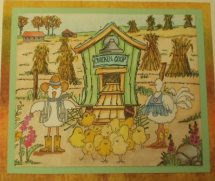 Sandra what a fun farm scene love all the animals and colors! 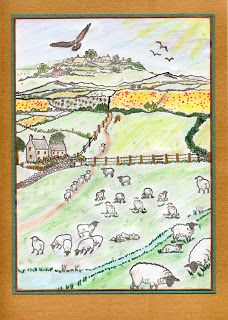 Monica love your watercolor scene. The sheep in front are just adorable! you made two lovely cards with the chickens. I like the whole scene! beautiful coloured. thank you for your entry this month. prachtige boerderij scene heb je gemaakt, erg leuk met de schapen en de huis op de achtergrond. erg mooi ook zijn de kleuren die je hebt gebruikt en dat ze zo inelkaar overlopen. dank je wel voor je bijdrage deze maand.